A floating head!! 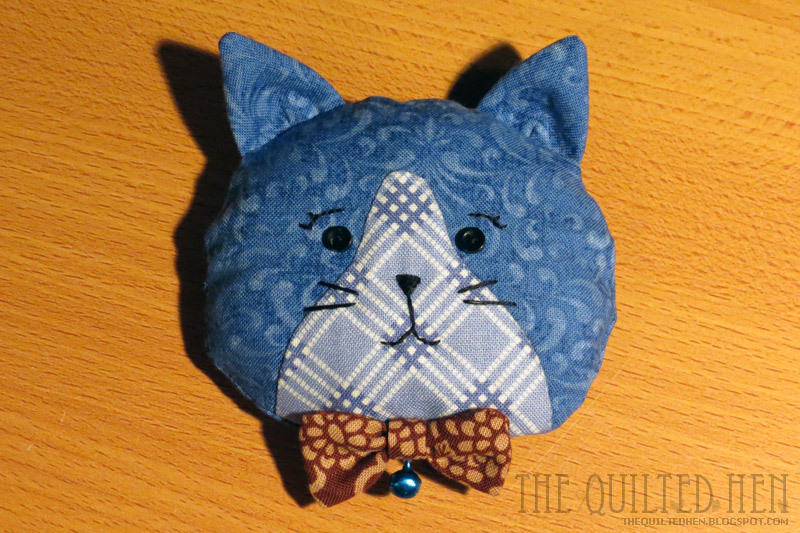 As the title says, this is going to be a pouch... and actually I'm a little stuck on if I'm going to try and embed the zip into the pouch sewing process or hand sew the zip in at the finish - Japanese quilting style - so I made the head first. This little cat is inspired by the gorgeous design by Ning Rueanmai. Hers are phone cases, but I thought I would make one big enough to be used as a glasses case instead for a Christmas gift, and while I don't know exactly what it will be used for I think a little larger will give more options. No patterns forthcoming for this one since it is someone elses design! Check out Ning's Etsy shop because she makes some gorgeous Japanese and Korean style quilted bags and purses! Oh yeah... and I've been distracted from the embroidered band and nyan cat, but I'm using the excuse that I'm still waiting on the post! I'll get back to them soon as I was hoping to get one finished by this weekend! I have not tried the Japanese way of putting in the zipper, but to me it looks easier. Do you like the result you get that way? I've tried the Japanese way a couple of times. Last time was for the frog pouch and I unpicked that 4 times I think because I kept messing up the direction and placement. I think I naturally take more care machine sewing a zip so I'll need to double check before hand stitching zips too. It is definitely easier on curves to hand sew the zip and the result is still nice if you take care, but you need to go back and hem down the inside which takes time and I don't have the hang of that stitch 100% so it looks bit messy and I space it too far apart. More practice needed! So with the japanese handsewing method... Con is that the lining doesn't go all the way up the inside of the zip. Pro is that the zip is easier to stitch into tight curves.